The 12-ft. (3.6 m) wide attachment weighs 2,200 lbs. (998 kg) and the 14-ft. (4.2 m) wide version weighs 2,400 lbs. (1,088 kg), offering snow removal contractors and municipalities an alternative to buckets and traditional plowing when cleaning parking lots and roadways. 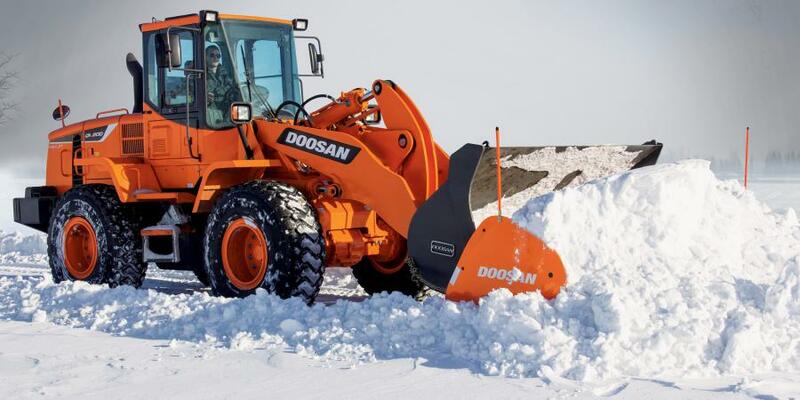 Doosan 14.3 to 22 ton (13 to 20 t) weight class wheel loaders and tool carriers can quickly clear snow when paired with bucket-mounted snow pusher attachments. The 12-ft. (3.6 m) wide attachment weighs 2,200 lbs. (998 kg) and the 14-ft. (4.2 m) wide version weighs 2,400 lbs. (1,088 kg), offering snow removal contractors and municipalities an alternative to buckets and traditional plowing when cleaning parking lots and roadways.